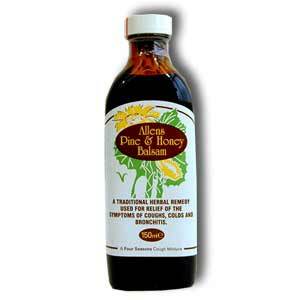 Allens Pine & Honey Balsam contains active ingredients that are known expectorants. These help loosen persistent tight chesty coughs and other secretions such as those suffered during colds, coughs and bronchitis. Ipecacuanha liquid extract, liquorice liquid extract, pumilio pine oil, squill oxymel, anise oil, capsicum tincture, chloroform, ethanol, diethyl ether, menthol, arrowroot, peppermint oil, syrup black treacle, purified water. Do not use if you have a kidney or a heart complaint, if sensitive to colophony, any other ingredient, or when pregnant or breast feeding except on doctors advice. Not recommended for children under 5 years. Do not exceed the stated dose. Click the button below to add the Pine and Honey Balsam 150ml to your wish list.